B-TEMIA Inc., the market leader in human augmentation, has initiated a multi-centre pivotal clinical trial, aimed at demonstrating the clinical benefits and safety for home use of its powered assistive DemoskeletonTM technology, called KeeogoTM. Developed for patients suffering from reduced mobility due to their medical conditions, the clinical trail will be led by Principal Investigator, Chris A. McGibbon from the University of New Brunswick’s faculty of kinesiology and Institute of Biomedical Engineering. The study is expected to generate the required data to support the submission of a 510K pre-market notification to the U.S. Food and Drug Administration in 2016, a prerequisite to start commercialization in the United States. 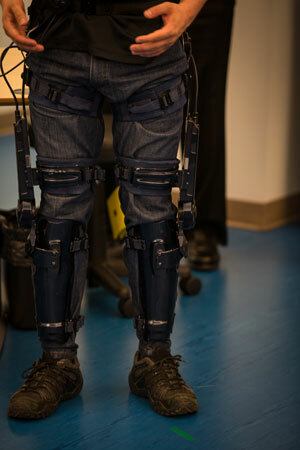 “This is the first international clinical trial involving the DermoskeletonTM technology that aims at demonstrating the efficacy and safety of KeeogoTM during everyday community and home mobility use, something that has not been possible in the past with other exoskeleton technologies that were developed principally for use in a clinical rehabilitation setting,” stated Dr. McGibbon. As part of the trial, B-TEMIA has partnered with three of the most reputable rehabilitation institutions in North America: the Rehabilitation Institute of Chicago, the Spaulding Rehabilitation Hospital Boston, and the Toronto Rehabilitation Institute–UHN. “This pivotal clinical trial will be key in supporting the commercial launch of KeeogoTM in the U.S. market. Based on earlier very positive pilot studies, we are confident that it will demonstrate how KeeogoTM could significantly improve the daily activities of those who suffer from disabilities that impact their mobility,” said Mr. Stéphane Bédard, President & CEO of B-TEMIA. KeeogoTM is a powered assistive walking device and is the first product incorporating the DermoskeletonTM technology developed by B-Temia. KeeogoTM has been used by individuals with medical conditions such as osteoarthritis of the knee, multiple sclerosis, Parkinson’s disease, and other conditions that impact mobility. KeeogoTM is already commercially available for rental or purchase in Canada. It is not yet available in the United States. B-TEMIA Inc. is a medical device manufacturer that develops and markets products in the growing market of human augmentation systems. B-TEMIA operates through two wholly-owned subsidiaries, B-TEMIA Health Inc. and B-TEMIA Military Inc. B-TEMIA owns a patent-pending wearable DermoskeletonTM technology that restores, maintains or enhances the mobility of users. The University of New Brunswick (UNB) is Canada's oldest English-language university. Founded in 1785, the multi-campus institution has a rich history and a dynamic focus on innovation, experiential learning and entrepreneurship. UNB has nearly 10,500 students from nearly 100 countries while several thousand more take UNB courses online and at partner institutions around the world. UNB contributes significantly to the province of New Brunswick with an annual economic impact of $1.2 billion on the provincial economy over the course of one year—equivalent to 4.5 per cent of the gross domestic product of New Brunswick.